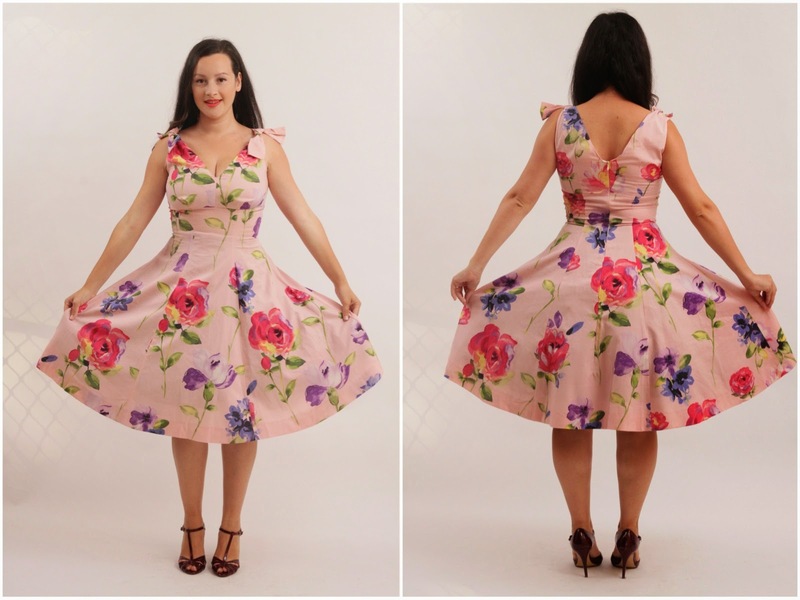 JuliaBobbin: Vintage and Pink - Butterick 5603 Strikes Again! 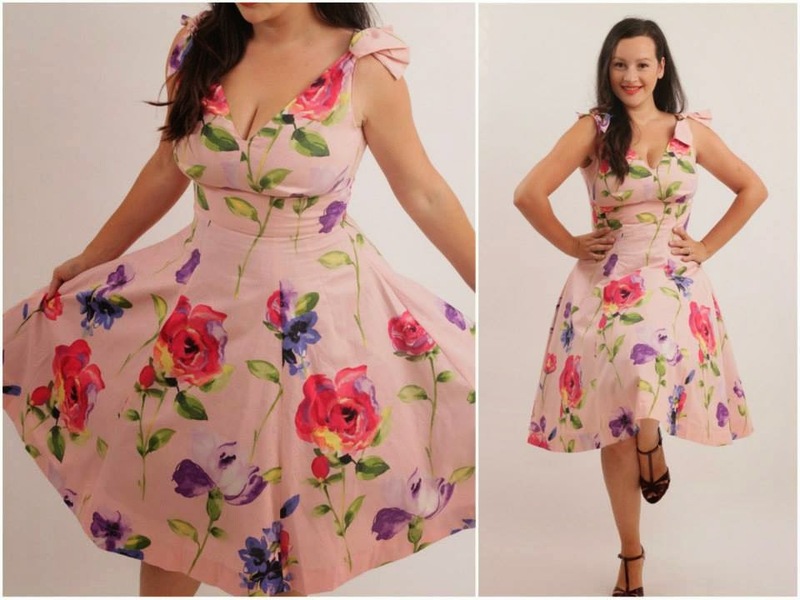 Vintage and Pink - Butterick 5603 Strikes Again! "You're not going to believe this, but Julia Bobbin has done something different and made a vintage dress!" Yes that's right, I make a lot of vintage. You're more likely to find a 50's ball gown in my closet than a pair of jeans (though I do love them!). And people, I don't think it's ever going to change. Wearing vintage for me is like putting on a pair of sweat pants at the end of a long day; it just makes me feel comfortable. But don't freak out, I love my modern too, and my next few blog posts are a delicious mix of 'now' clothes. Here's one of my most recent dresses, just in time *cough* for my Mad Men Challenge that wrapped up weeks ago. It's Butterick 5603 in it's original form. Does that pattern ring a bell? It might be because I've used this pattern FOUR times already to make a pencil skirt version. Butterick 5603 Version B. I stitched this up in a size 14. I used a quilting cotton that I purchased from Spotlight a while ago. I used an invisible zipper and inserted it down the centre back instead of the side. I didn't see anything wrong with this until I realised half way through my cutting that the back of the skirt does not have a centre back seam. Oops. I ended up slashing it down the centre back with a tiny allowance and it worked ok. Phew! I also did a FBA (Full Bust Adjustment) on the bodice which definitely helped. Instead of making facings I used bias binding to edge the neck and sleeves as the dress isn't lined. It's fair to say I like this pattern, seeing as I've borrowed from it five times. This however is sort of the first time I've really made the pattern, as I made it without styling alterations. I love how the gored skirt and fitted bodice give a flattering and feminine shape. The little ties at the top of the shoulders add to the sweetness of this dress and the full skirt is fun and swirly. 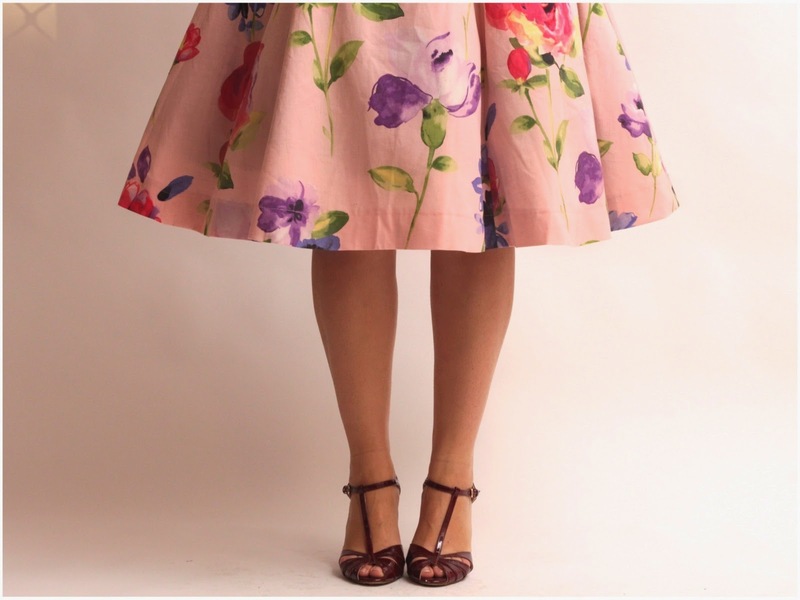 The dress is teamed with a burgundy pair of heels, and a nice full petticoat, which makes such a difference when you're wearing a full skirt! I finished off the look with my favourite lipstick at the moment 'Siam' by Nars. I was overcome with 'I have to have this colour' when I read the fabulous review by my girl over at Muskstick Mao who knocks this colour out of the park! Have a look at your me-mades. Do you have a pattern that keeps repeating itself? Your favourite go-to? I'd love to know! Your pencil skirt versions are so lovely that I might have to buy the pattern! Do it! You won't regret it :) Thanks Alice! Thanks Diya, I've got a lovely husband who is patient enough to take the photos for me. That's a lovely dress. I have a Maudella dress pattern that I've made 3 times. It's rather 70s and has a zip front. I changed it ti have a button through like a classic shirt dress. Oh that would be gorgeous. It's great when you find something that just works for you isn't it! I love that on you. I'm actually trying to make that pattern right now. The skirt looks great, but I am not very experienced at making bust adjustments and I'm on my 4th muslin of the bodice. I'm a D cup and I just can't seem to make it work. I have a classic hourglass figure so I thought this pattern would fit perfectly, but unfortunately it doesn't. I wish patterns where sold by cup size. Oh I hear you Tracey! I almost always have to change the bodice to account for a bigger bust and it would be so much easier if you could choose a cup size! Good luck with your drafting. Let me know if you need any help! Skirts are one of the favorite dresses in spring and summer seasons.And Nice skirts Designs. Holy smoked that's gorgeous - I love the shoulder ties and yeah I should probably make a gored skirt already, given how good they look on hips. Love the lipstick too - I'm a big fan of NARS blushes but haven't tried their lipsticks. Might have to wait though because I just did a big NYX order (like, 18 lipsticks)! Oh you look fab, well done! Anything other than a petticoat keeping that skirt so lovely? Special hemming techniques? My go to pattern is New Look 6459. Everytime I wear one of my NL 5469s, feel like I'm Monica Belllucci. I need a version for this summer I think! Wow, you look stunning! What a gorgeous dress! Lovely dress and love the lip color, too! Nothing wrong with remaking a pattern, you know it's really flattering on you and already have the muslin fitting…! I've remade MadebyRae's Washi and Simplicity 2444 several times. I changed up the neckline and sleeves and totally different prints on each one and I love them all. haha. Great dress, shows the fun and joy of spring. What a pretty dress! It looks fab in you. Your fabric choices are always spot on! Aw, wish I were still young enough to pull off a dress like that! Enjoy it while you can. i love a good floral print, and THAT is a good floral print! lovely dress! Its a beautiful dress, and fits perfectly. You look terrific in all versions of this pattern, so where is the problem in making it a lot?! I cannot believe that is a quilting cotton - it's so fabulous! I just love this on you. What are your thoughts on the shoulder ties for layering? I was concerned they might be weird under cardis? Then again, with this dress I can't imagine you would ever layer it!! Well this is the marvellous part ... they're not actually attached! Just knotted around the shoulder seam. It wasn't until your comment that I realised that this is actually a good thing, because it means you can remove them when wearing cardigans! Genius! Beautiful dress! What is the fabric called ? I think I need t for my stash. My sewaholic Cambe dress seems to be the most used in my pattern bin. The bodice fits so well and lends itself to lots of skirt variations. That fabric is fab and you look smashing in that dress! so SO beautiful!! and, hey, if you know what works for you - than keep making it!! and girl, this WORKS for you!! i've made B5603 up a few times now, in this form and I really love it - the pieces just seem to lend themselves to such a perfect sillouhette! Love this one. I was wondering where your Madmen make was - this is gorgeous. I used this pattern for my first Madmen Challenge dress and plan to use it again some day. My go to pattern has to be New Look 6699, I've made 6 versions so far and I'm sure there'll be more. I thought I left a message. Apparently not! I love, love this dress! You look absolutely fantastic in it! I love all of your variations. I'm going to get this pattern, thank you! I just want to wait for a sale. Did I mention, I love your fabric? No? I love it! The perfect summer dress to have in your closet! Garden Party or Casual Dinner dress!Great print!! Wow your dress is sensational. If you love vintage patterns you might like this one from the V&A Museum in London. It's of a Horrockses dress in their collection. I'm tempted to make a dress using the bodice. Beautiful dress! I was wondering if you could tell me more about the petticoat you are wearing? Is it a special brand or did you make it yourself? How long has to be a petti to look good? Are whites easier to wear than black or other coloured petticoats? What a lovely, perfect summer dress! Sooooo gorgeous. Said everybody, always. Another beautiful make!! I love the shoulder ties and that awesome giant floral print! Oh, beautiful! You *and* the dress! Love it! Gorgeous dress, gorgeous fabric. Beautiful dress for the summer. Too cute! This dress is so nice! Wow. You look fabulous. 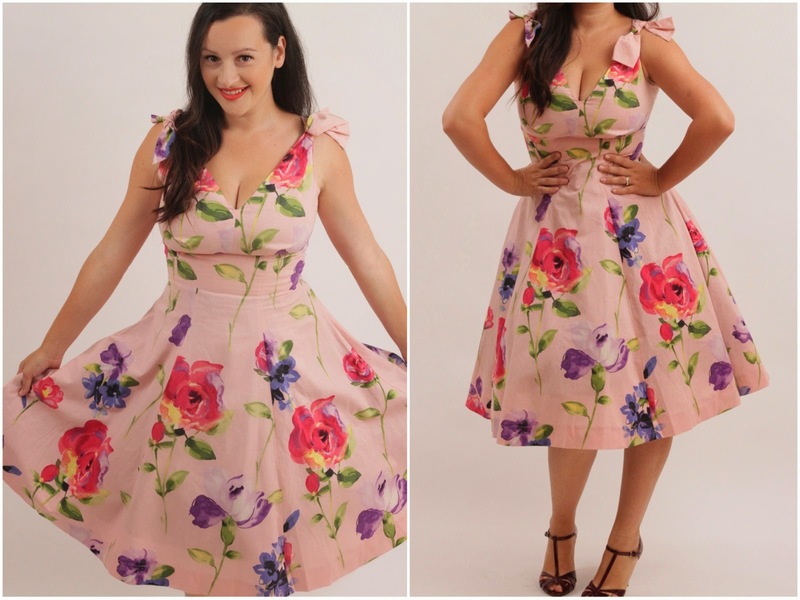 You need to make more vintage frocks - you look amazing in them. Bravo! I love your dress. It's stunning. Hello! wow this is gorgeous! well done. 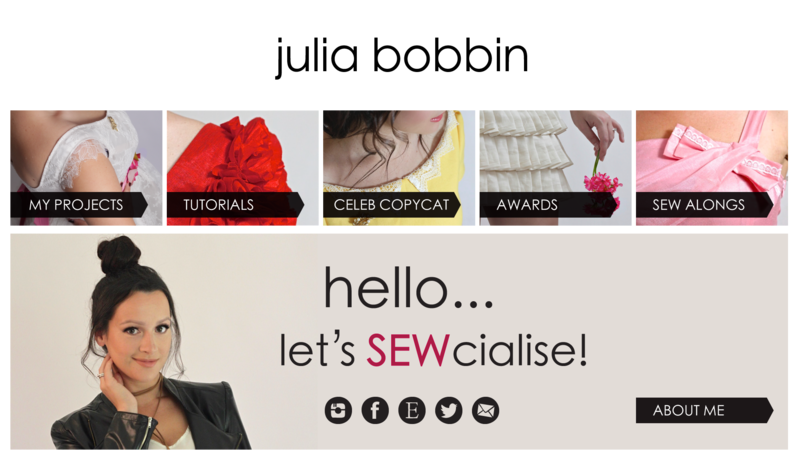 I am a pretty near beginner sewer (sewist? sewing doer? )and am about to start a term of night classes to up my skills from can-make-pjs-for-my-kids-and-a-basic-top-for-me, to something with *gasp* buttons, zippers, pleats etc etc. Given that I am reasonably confident with the most basic of basic, and will be supported by a tutor during class, do you think this pattern would be doable? I would rate myself as aspiring-intermediate ;) I don't think I would need to make any adjustments as I am a pretty stock standard size, proportionally. Thank you! well done again, this is just the sort of thing I am hoping to make, maybe one day I'll make it half as well! Hey, just wondering how the sizing works on this pattern as its an old one... is there a dress size to inch conversion at all?